Happy Monday! There are many things that make me happy, and when we’re talking food, a quick and easy meal is definitely high on the list. We all have those days when the last thing we want to do is put a huge effort into cooking. Which is why it’s important to keep meals like this in mind. It doesn’t get any easier than this. Five ingredients that yield a ton of flavor. Plus it’s good for you. Preheat oven to 400 degrees. Combine squash, oil, and garlic powder and mix until evenly coated. Spread on a foil lined baking sheet. Roast for 20 minutes. Remove squash from oven and stir (while on baking sheet). 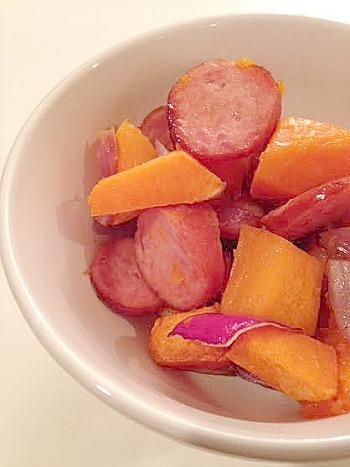 Mix in kielbasa and onion and roast for 15 minutes. Stir and roast for another 5-10 minutes. Serve over rice or alone, like I did. 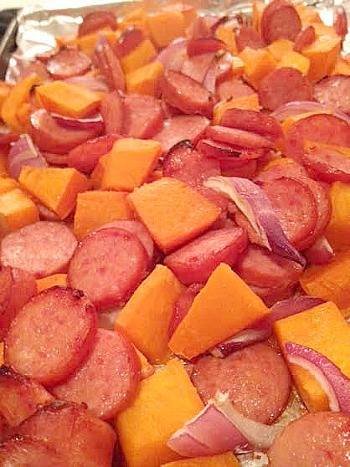 This entry was posted in low carb, main dishes, QuickAndEasy, squash, turkey. Bookmark the permalink. Thank you! I need to use up my squash and happen to have all the other ingredients in the fridge! Great quick and easy meal! Yummy! Tasty recipe! Super easy and delicious. Thanks!